There was, however, no friend around at the time, so sleep-deprived, I drew. And I drew some more. I thought I’d completed the drawing I was working on. However, in the bright morning light…my picture looked like a mess of scribbles. Okay, somewhat orderly scribbles, but scribbles none the less. Fortunately, not all is lost, I think I can go back over it, and make it look more as if a human, as opposed to chimpanzee, drew it. I worked today, though, at my day job, so I’m tired, so tired. If I don’t want to make the same mistake twice, I’d better lay off of it for now. 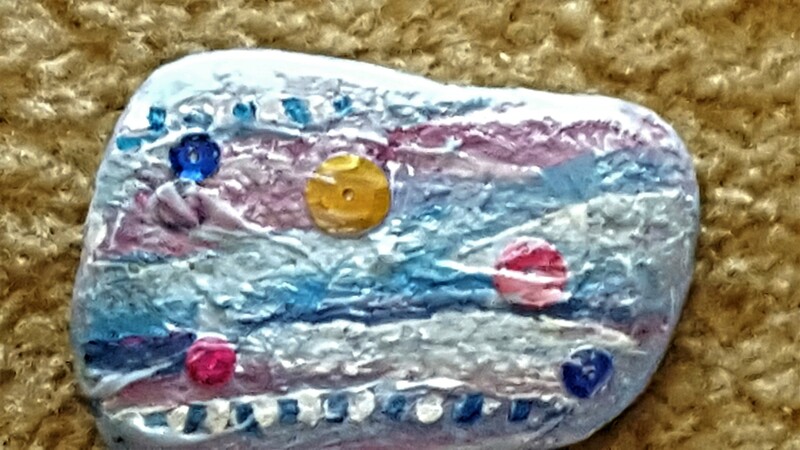 But…earlier in the day, my friend and I did a lot of work on our decorated rocks. So, here’s my first Danbury Rock, ready to go .